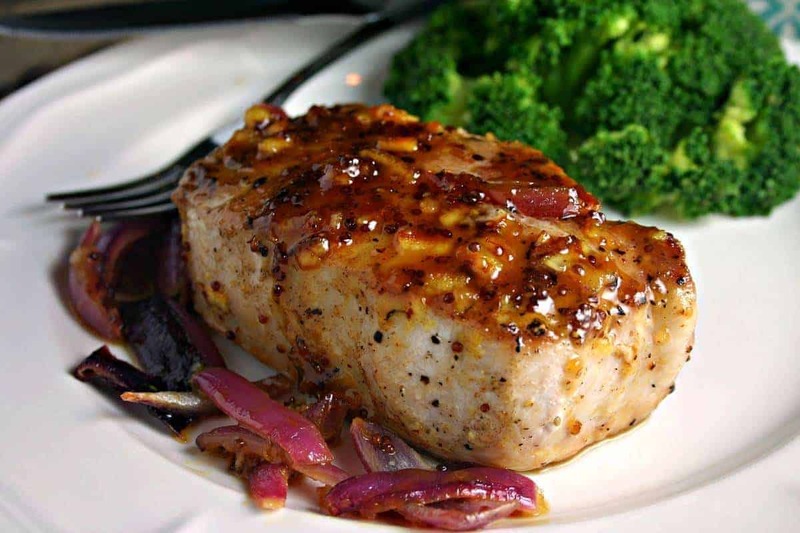 Oranges and a good-quality stone ground mustard make a wonderful glaze for these delicious oven-baked Orange Mustard Glazed Pork Chops. 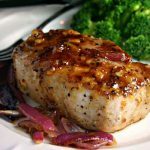 Before I tried this recipe, I used to think that the only way to get a tender and juicy pork chop was to marinate the meat for hours before grilling or let them cook all day in the slow cooker. Well, that myth has just been busted! First, with this recipe there’s no marinating involved. Second, this meal can be ready in around 40 minutes, start to finish. To make this delicious dinner, start by making a simmering sauce using three simple ingredients: fresh orange juice, a good quality stone ground mustard (my favorite is Trader Joe’s), and a couple tablespoons of orange marmalade. Simple, right? Tasty? You bet! While the sauce is simmering, sear the chops in a hot skillet until golden brown and both sides (just five minutes or so). Add red onions along with a couple sprigs of fresh rosemary to the skillet, and then pour the simmering sauce all over the top. Pop the skillet into a preheated oven and bake until the chops reach an internal temperature of 140 degrees (about ten minutes — I told you this recipe is really quick!). The last step is adding fresh lime juice to deglaze the skillet and finish off the sauce. Just look at that beautiful glaze! I put this recipe in the company-worthy category. I’ve made this recipe several times and have never been disappointed. 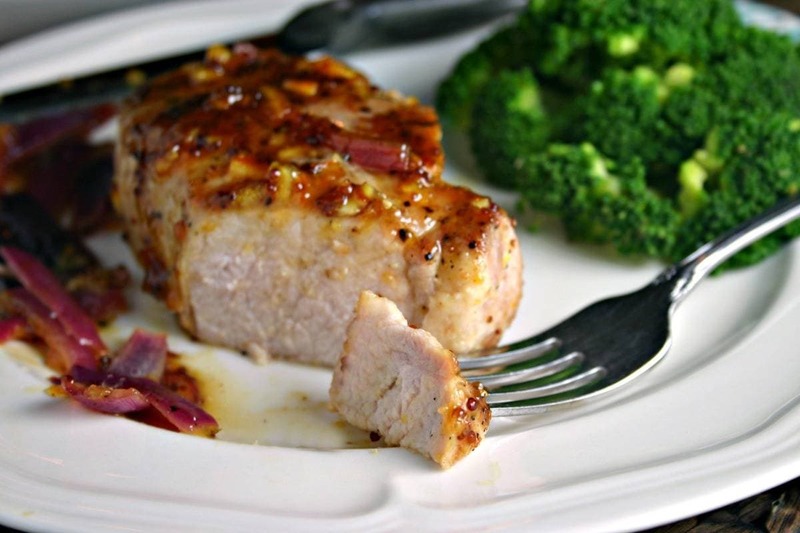 The chops are always tender and juicy and the orange-mustard glaze is the perfect compliment to the pork. And as an extra bonus, this recipe is healthy! Tips: Bone-in chops can be used, if desired. Double the sauce ingredients if you’d like extra dipping sauce. Serve with steamed broccoli or asparagus for a complete, easy meal. Enjoy, friends! In a small saucepan, combine orange juice, marmalade, and mustard. Bring to a boil and immediately reduce heat to a simmer and cook until syrupy, about 15 minutes. Heat a large ovenproof skillet over medium-high heat. Add oil; swirling to coat bottom of pan. Season both sides of the chops with salt and pepper. Sear the chops in the pan for about 5 minutes, or until browned. Add rosemary and onion to pan, then pour juice mixture over pork. Bake for 10 minutes at 425 degrees or until a thermometer registers 140 degrees. 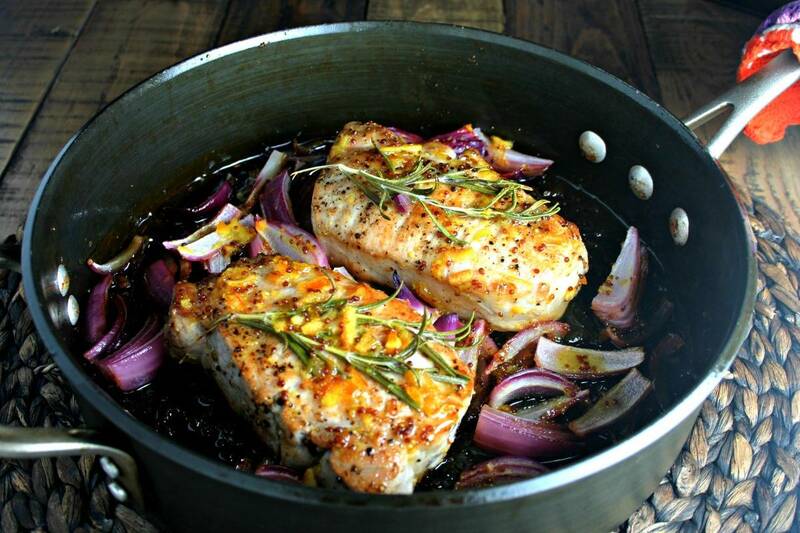 Remove onion and rosemary to a platter and return the skillet to the stovetop. Add lime juice and cook over medium high heat for 4 minutes, or until liquid is syrupy. Add pork to platter and drizzle with sauce.